Asterisk voice prompts in Finnish. All Professionally sound recorded by native speaking voice artists. When it comes down to how your business sounds, there is only one factor that really matters; the voice of the person who answers the phone. Our Native speaking voice artists are not only Finnish, there from the top Finnish voice artists in the industry. Fully-featured professional finnish voice prompts for your system. 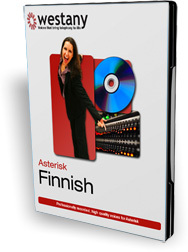 Our Finnish voice prompts for Asterisk come with all the standard voice prompts to allow you to use the full functionality of the Asterisk PBX right out of the box. This includes Voice Menus, Call Queues, Follow me, Call transfers, Call Parking, Voice Mail, Transfers, Error messages, Numbers (digits), letters and Phonetics. There are also language specific syntax additions that are not standard to Asterisk but are required for the Finnish language.